Richard Ladner standing with Kavita’s robot, which includes cameras, a microphone, a screen, a built-in speaker, and wheels, allowing Kavita (pictured on screen) to move and speak to people while teleconferencing. Attending the 2014 ACM International Joint Conference on Pervasive and Ubiquitous Computing (UbiComp 2014) in Seattle, Washington via the Beam Telepresence Robot was a memorable experience. Although I was unable to attend the conference in person, I participated in a user study, which provided me the opportunity to attend and interact with other attendees remotely. The telepresence initiative user study was organized by the Co-Chairs Dr. Carman Neustaedter, from Simon Fraser University in Canada, and Gina Venolia, from Microsoft Research. The Beam robot, created by Suitable Technologies, allowed me to have mobility by using a wheeled battery powered device with voice conferencing and telepresence capabilities. The Beam includes two wide-angle cameras, a six-microphone array with echo-canceling and noise reduction, a seventeen inch LCD screen, an eight hour-battery, two dual-band radios providing Internet connectivity, and a built-in speaker coupled to a mobile platform. The Beam has great maneuverability and can be driven using a mouse, keyboard, or Xbox controller. Participants were also given the option to personalize their Beam robot with a label that displayed their name and contact information. I had the opportunity to meet amazing researchers from across the country as well as individuals from China, England, Sweden, and Italy and engage in discussions about varied and interesting research projects as a bridge to meaningful mentorship and guidance. Although I have spoken with Dr. Richard Ladner via phone, Skype, and email for over ten years, it was exciting and gratifying to meet him for the first time physically, albeit in virtual space, thanks to the Beam robot. Using the Beam robot provided a sense of dynamic and real-time presence in the actual conference environment. It was great to be able to join discussions after the presentations, and I enjoyed having autonomy and independence while driving and operating the Beam robot. Nevertheless, the experience wasn’t perfect. I would often lose Internet connection inside the elevator and between presentation sessions when there was significant traffic on the network. Other challenges included audio and video problems. For example, feedback from my microphone caused disturbances in the sound quality, so I had to frequently adjust the volume on the microphone. Although I felt totally immersed and connected at the sessions of the conference, I had a sort of “jet-lag” because of the time difference between Maryland and Seattle, and I felt a sense of disconnect because of the differences between my home and the conference site. I look forward to attending future conferences using the Beam robot or similar technology. 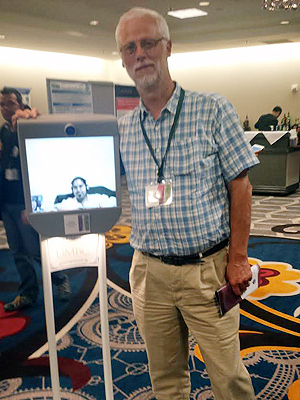 In fact, as a result of the UbiComp 2014 conference experience, I was able to work with AccessComputing to remotely attend the International ACM SIGACCESS Conference on Computers and Accessibility (ASSETS), which was held in Rochester, NY using a Beam robot. For someone who is unable to travel to professional conferences, these two experiences were unparalleled.